Neō Wax Bloom is the product of insatiable and earnest curiosity about musical subcultures. It becomes a museum of contemporary digital sound, and Iglooghost its curator. If you’re familiar with UK-based producer Iglooghost, aka Seamus Mallagh, you already know. So skip the review -- just go out and buy the album. Let it titillate your senses. But for those who haven’t heard the music of our icy apparition -- and there are many -- my heart goes out to you. I also envy you. Soon enough, you too will experience his technicolor menagerie with virginal ears. Take example A: a prototypical Iglooghost track. Now try to describe it? See how hard that is? Neō Wax Bloom, the producer’s full-length debut on Flying Lotus’ Brainfeeder label, is nothing short of sonic onslaught… in the best way possible. With Iglooghost, there are no breaks (except on his Sleep mixtape, which constitutes one very long break.) Even his moments of stillness are supercharged with potential energy. It’s dense and sparse and focused and incredibly unfocused, all in one go. There’s plenty of blank canvas, but hung in the fibers is every noise you can imagine. Call it maximalism if you like. With a whiz and a whir, a buzz and a burr, sounds of all shapes, sizes, and colors creep in and leap out from every direction in four (five??) dimensional space. It’s an unstable, shape-shifting creature -- kind of like the 2nd-Gen Pokemon that inspire the work. Neō Wax Bloom is the product of insatiable and earnest curiosity about musical subcultures. It becomes a museum of contemporary digital sound, and Iglooghost its curator. With each track, he dips into his bulging grab bag to reveal a unique amalgam the day’s EDM conventions: wonky, UK bass, future garage, and the bubblegum bass of hyperreal pop collective PC Music. The songs are built up from layers upon layers, making them super slippery. Notes of jazz and eastern musics float overhead western classical tradition. You have folk tunes beneath pop hooks beneath ambience beneath a dance beat beneath a Soundcloud rap, all atop a tropical rainforest soundscape. It’s nuts with a capital U. This jazzy ditty runs rings circles even FlyLo’s more impressive output. For all these reasons, Neō Wax Bloom, will inevitably be considered a “headphone album” -- not that it wouldn’t work in the club. You’d just first have to slip the DJ a powerful fungal brew, which… don’t. These songs are just too hyperactive, too scatterbrained, too…weird for the EDM circuit. But the fault lies not with Iglooghost, but rather synthetic sense of raver PLUR-alism. And a final note on how it sounds: Mallagh has a clear fixation with Japan, or technically, Japan and the West’s re-appropriation of Japanized westernisms. You can hear it at almost every moment in this clash of extremes, of repression and expression, the tiny and the terrific. "It’s a long story. In real life, I live in this huge mansion that changes color, glows in the dark, and has a lot of floating parts/rooms. It’s a really weird looking place until you get used to it. Anyway, I have this giant garden I hang out in a lot, and I met these strange little beings through a little portal I found. I learned about the void some of them live in that’s called 'Mamu', and how a giant calamity involving two huge eyeballs falling from the sky had completely screwed up their ecosystem. I made a big album inspired by all this stuff. So it’s not really a concept album, considering it all actually happened I suppose." You heard the man. To me, with its recurring characters and musical themes, the record feels a lot like an opera. One of the more stinking things about Iglooghost’s music is the perpetual self-sampling of his own theme, a sort of omnipresent branding. First heard on his [Little Grids EP], Charlotte Day Wilson’s haunting hook, appears again and again on the album, each time in an altered form. 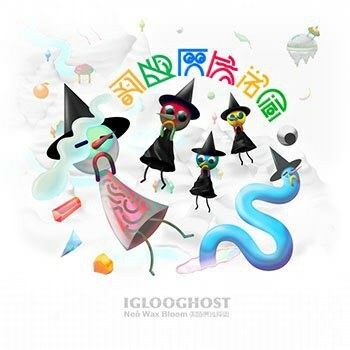 If humanity hangs in long enough, we will live to see the impact Iglooghost had on our music. It’s going to be a bottom-up kind of influence on pop production and composition, with a clear line from the avant-garde. Bear in mind, he has only just begun. (Any conversation about Iglooghost is incomplete without mention of his age: old enough to order a pint in his Belfast home but not a craft IPA this side of the pond.) The artist falls among the ranks of Aphex Twin, Amon Tobin, Arca -- artists who found their sound and then kept finding it further. Like these producers, Iglooghost has deeply tapped into the musical ecosystem. So adaptive is he to his surroundings, the surroundings will have no choice but to adapt right back. As eclectic as they are, there is a sense in which Iglooghost’s tracks seem to bleed together -- not because he’s settled into this sound, but his palette has colors no one else can see, at least in that particular combination of waves. Now, as the life cycle for synth and vocal FX grows ever smaller, it’s hard to say whether future generations will look back on the sound of Iglooghost as something hyper-timeless or hyper-dated. Though these days, there hardly seems to be a difference.